We are so grateful to have had a wonderful year. Thanks to YOU, we were able to donation to rescue groups like the Puppy Rescue Mission, Col Potter Cairn Rescue Network and Friends of the Burlington County Animal Shelter. Thank you for your continued support and generosity. 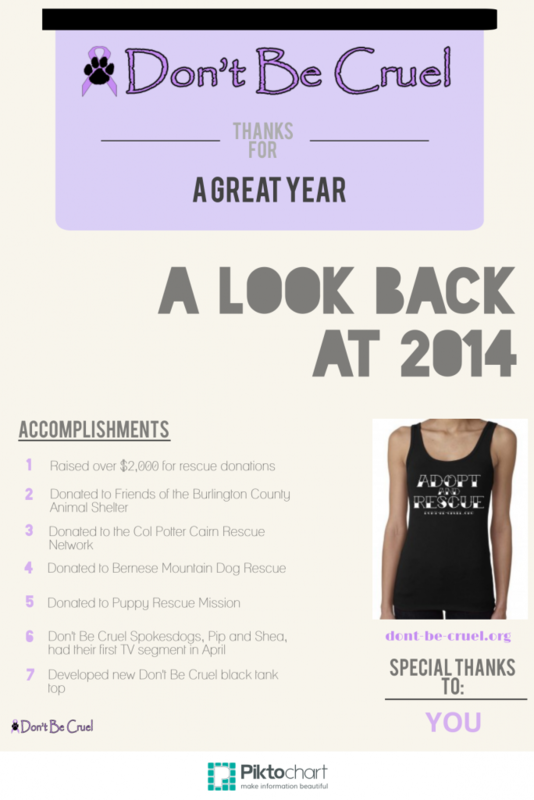 We hope that our Don’t Be Cruel community continues to grow in 2015. This entry was posted in News and tagged Col. Potter Cairn Terrier Rescue Network, Don't Be Cruel Animal Rescue, Friends of the Burlington County Animal Shelter, Puppy Rescue Mission, Year in Review 2014 on December 31, 2014 by Belkis Cardona-Rivera.